While Orr Fellowship proudly calls Indianapolis home, Orr Fellows are often found all over the country (and world) traveling for work, pleasure, or sometimes a mix of both! Imagine yourself joining some of our adventORRs in this Travel Blog Series. As I started to get settled at my new job at hc1.com in June of 2017, my manager met with me to tell me that starting in January 2018, she would continue working for hc1 but would be traveling abroad for six months, living in a different country each month, through a work remote program. My first thought was…well how is that going to work with me in Indianapolis, I obviously NEED to come with you, right?! I’ve always loved to travel, explore new places, and learn about other cultures. A program like this sounded right up my alley. There is this other program that is also right up my alley though…Orr Fellowship! As a new Orr Fellow, I had so much to look forward to in Indianapolis over the next two years, something I wouldn’t want to miss. So instead of hopping on a plane and following my boss around the world for six months, my coworkers, Nichol (another Orr Fellow), Lizzie (a coworker on my marketing team) and I started to plan a trip to visit her. Fast forward 11 months and we were getting on a plane to visit my boss in Peru! We chose Peru because there is so much to do and see, namely Lima, Cusco, and Machu Picchu. 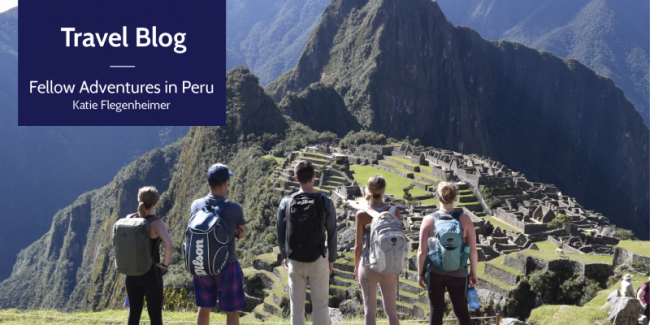 Peru has a rich and unique culture, amazing food, and is a huge backpacking destination because of all of the hiking and adventure you can find in the nearby mountains. The three of us were so excited for the opportunity to explore a new country and for some major team offsite bonding. During our second day, we went sandboarding – think snowboarding but on sand – on these beautiful dunes outside of Lima. We enjoyed trying, falling, and laughing at each other as we all attempted this new sport. After spending three days in Lima, we traveled to Cusco. We all loved Cusco, with its gorgeous town square, narrow cobblestone streets, and fun hostel where we stayed. We also learned what it’s like to struggle to breathe because at 11,000 feet, the altitude is no joke! A major highlight of the trip was our overnight Machu Picchu adventure. We hiked for half a day on the Inca Trail and climbed our way to the sun gate, the formal Inca entrance to the ruins. Peering down at the formerly lost city nested in the middle of mountains was one of the most magnificent views I’ve ever seen. The following day, we toured Machu Picchu and learned all about Inca history and culture. During the entire trip, we enjoyed many classic Peruvian dishes, Lomo Saltado (steak and vegetables) was a group favorite, and explored markets where we bought many alpaca products (sweaters, hats, scarves, you name it). We were even able to get some work accomplished thanks to the inspiration of our new surroundings. This trip was a truly incredible experience that would have never happened if I was not an Orr Fellow at my Host Company, hc1.com. It is amazing that hc1 allowed my boss to go abroad for six months, still maintaining her position and communication with our team. The three of us who went to visit her were able to take advantage of hc1’s unlimited PTO and working remote culture to go join her and explore a new place as well. Not only was it great to travel with coworkers, it was also a blast to travel with another Orr Fellow. Nichol and I had always worked and spent time together in Indy, but we had a wonderful time as travel buddies exploring Peru. Travel can be intimidating and challenging but it can also lead to some of the best times and memories to look back upon. It’s exceptional that I have an adventurous team at work that can get together, plan a trip, and have a blast in another country. We are also productive as a team; working well with one another and running a marketing department on a daily basis. I’m so grateful that hc1 and Orr are both so supportive of me pursuing my goals of seeing the world while working toward my professional growth as well.